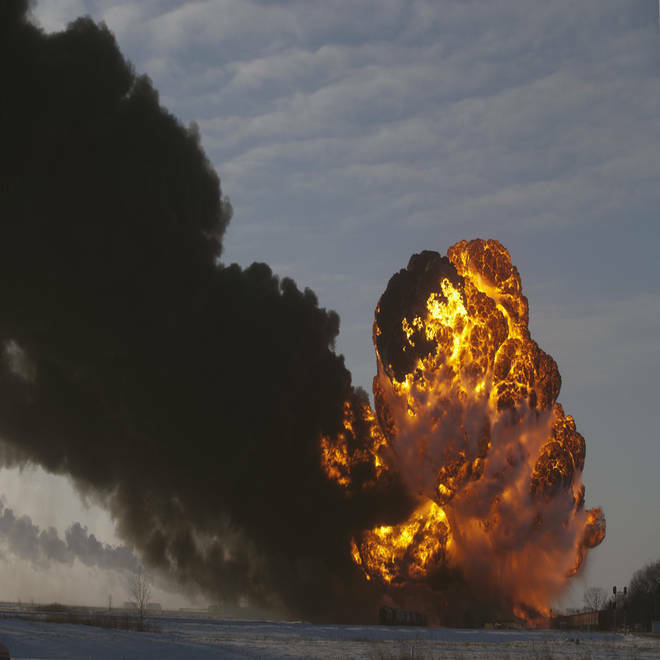 A fireball erupts at the site of an oil train derailment on Monday in Casselton, N.D.
A mile-long train carrying crude oil has derailed and exploded, triggering a "giant fireball" after colliding with another train in North Dakota on Monday. A mile-long train carrying crude oil exploded in Casselton, North Dakota near the homes of 2,000 residents who officials are "strongly recommending" evacuate the area as a forecasted shift in the wind could send hazardous smoke over the town. The Cass County Sheriff's Office said on Monday night that it was "strongly recommending" that residents in the town of Casselton and anyone living five miles to the south and east evacuate to shelters set up in Fargo, which is about 25 miles away. Casselton has about 2,400 residents. The sheriff's office said the National Weather Service was forecasting a shift in the winds that would push the plume of smoke down, possibly posing a health risk. Earlier, authorities had advised nearby residents to shelter inside their homes. 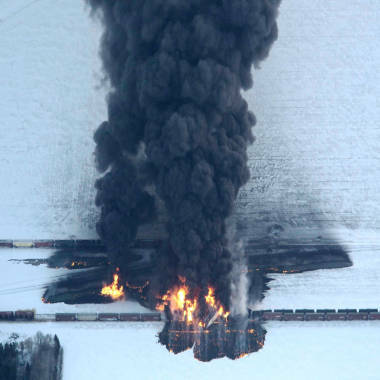 The freight train carrying crude oil hit another train hauling grain that had derailed on Monday afternoon, causing an explosion and sending flames shooting more than 100 feet into the air. No injuries were immediately reported. Authorities said local emergency crews responding to reports of a derailment discovered the oil train burning, with up to 10 cars fully engulfed. “There was an explosion, where a car let loose and there was a giant fireball, hundreds of feet in the air,” said Assistant Chief Gary Lorenz of the City of Fargo Fire Department, who was in touch with a crew on the scene. Smoke rises from a derailed train near Casselton, N.D., on Monday. The collision occurred at a street intersection just before 2:20 p.m., when the westbound BNSF Railway train carrying grain derailed and was then hit by the eastbound train carrying oil, Cecily Fong, a public information officer with North Dakota Emergency Services, told NBCChicago.com. Both trains were owned by BNSF, she said. Amy McBeth, a spokeswoman for BNSF Railway, confirmed the collision but said she could provide no additional details. Fong said the train carrying grain was approximately 111 cars long and crews were able to get the unaffected cars separated from the burning wreckage and moved out of the way. Fong said the Federal Aviation Administration was putting flight restrictions in place over the area due to the smoke. Kevin Thompson, a Federal Railroad Administration spokesman, told NBC News that the agency was sending investigators to the scene. "The Federal Railroad Administration and the Pipeline and Hazardous Materials Safety Administration have investigative teams en route to North Dakota and will work in concert with the National Transportation Safety Board, the lead investigator, to ascertain all the relevant facts that may have contributed to the accident," he said.